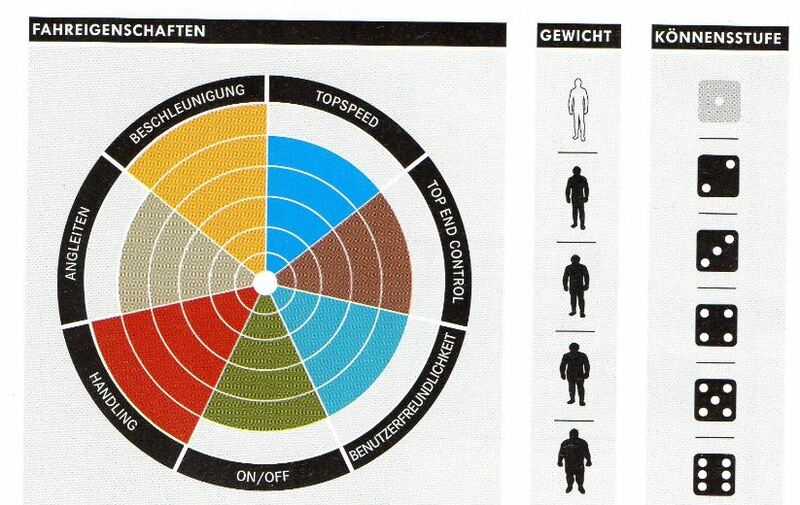 We are thankful to the magazines for taking the time to test our gear, so that you can easier choose your next quiver. 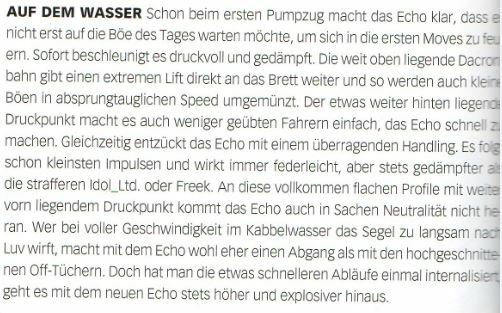 Here below we have a test of the ECHO 4.8, a long time favourite by the freestyle elite, but how did it fly with the judges…? 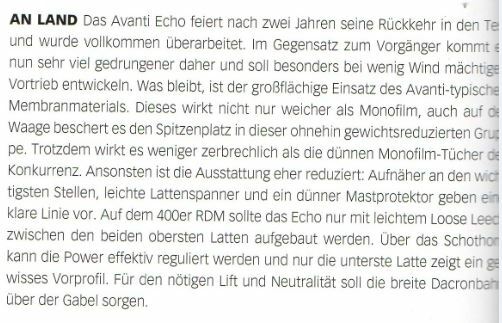 We have as always translated the test from German to English here below the original German text0. The Avanti Echo is celebrating its return to the testing grounds after two years and a complete makeover. In comparison to the ‘old’ model, this new version seems stouter and should be even more effective in lighter winds. What stays is the massive membrane material from Avanti. This material not only feels softer but also on the scale does this sail take the first place when it comes to weight. However unlike the thin monofilms otherwise used in this sail group by the competitors, this material seem less fragile. Most other details on this sail is reduced to a minimum, setting a clear vision for this sail. Light batten tensions, a light mast protector etc.. On the 400 RDM the Echo rigs up with only a very light Loose Leech between batten 1 and 2, the power can effectively be regulated via the outhaul and only the bottom batten indicates a bit of roundness. For the needed lift and neutrality, the sail is equipped with a wide Dacron panel above the boom. Already by the first pull in the sail, is it clear that the ECHO doesn’t want to wait for the first gust of the day, before going into the move. Instant acceleration which is powerful but neutral. This high placed dacron panel gives the board an extreme lift which means that also light gusts gives enough speed for setting of manoeuvres. The pressure point in the sail is a bit further back, which also allows for less trained sailors to get the Echo to do what they ask. At the same time, the ECHO thrills you with exceptional handling. It reacts to the smallest of inputs and always seem featherlight, but more relaxed than the stiffer Idol_Ltd or the Freek. The Echo does not completely reach the neutrality of these other totally flat profiled sails with a pressure point far in the front of the sail. If you duck the ECHO too slowly at full speed on choppy waters, you will rather wipe out than on the flatter shaped sails, but once you internalise the faster sequences, the ECHO always goes higher and is always more explosive! 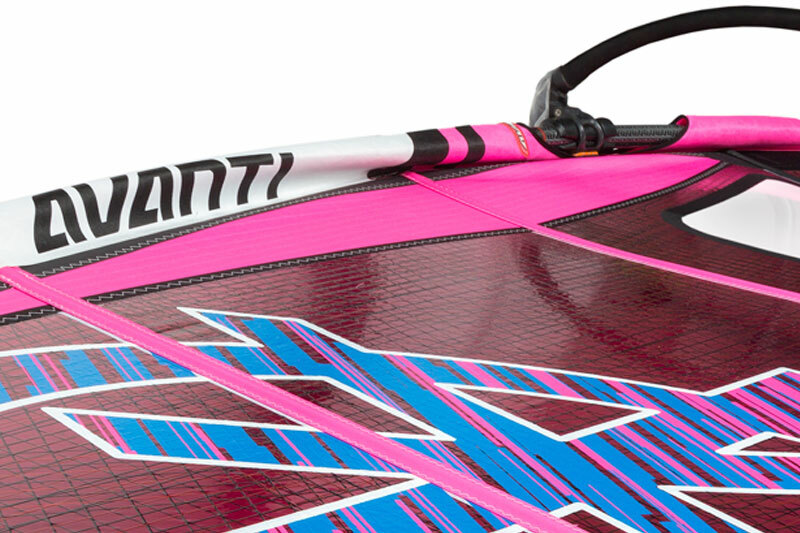 The new Avanti ECHO is a truly excellent freestyle Sail for a powerful style. The pop which is generated through the soft profile is out of this world. 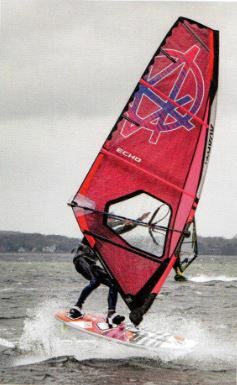 In this manner the ECHO is recommended for two sorts of freestylers: On one hand for light- and middleweight riders in light wind spots, who want to use the smallest sail possible with a lot of power and on the other hand the sail fits „big guys“ (heavy weights), who want maximum power in a handy package.